The only embroidery left on the Medallion project is goldwork embroidery… and lots of it! I really appreciate all the incredible input from you on the last article regarding adding the pink ring around the design, joining the roses – thank you so much for your take on it, whether positive or negative. You all gave me a lot to think about, and I really appreciated all your comments. I’ll be answering some of them when time allows. Ummm…. I did decide to keep the pink. It isn’t Pink-Pink, by the way (if “Pink-Pink” is allowable as a classification of Pinkness!). I would call it more of a “light red” or true “rose” color – not Candy Pink. 2. Finishing the gold around the center cinquefoil – just a tiny bit left on that (I’m actually a little farther along than the photo shows). 4. The outer rim of gold around the dark blue. In the photo, see the grayish line inside the blue basting line around the outside of the whole piece? That marks the end of the gold that will surround the whole Medallion. So, on that note, I better get busy! (And I don’t mean with laundry… and who needs groceries, after all? Cleaning house – naaaa!) Should we place bets on meeting the deadline? I’m aiming for April 15. Originally, I was aiming for Easter, but that isn’t going to happen. If you’d like to read the back story on this project and follow it from start to finish, you can find all the articles relating to it in the Medallion Project Index. Next week, I’ll show you some fabulous finishes from the Nesting Place online class that just came to a close this past week – some really gorgeous results there, and I can’t wait to show you some of them! Also, some fun and funky Stitch Play to spice up your spring stitching, and a few other tidbits that are currently developing. Oh, and you never know… there might be a book give-away in there, too! Now that you have more of the tudor roses done your decision to stay with the “rose pink” looks great. It supports the roses without shouting PINK!! !, and it’s subtle enough to create unity. Dear Mary , You have outdone yourself. This is truly a masterpiece. I just love it. What will this medallion be used for once it is done? 9″ is not big enough to go on an alter cloth and be seen by the congregation. Will it be part of a vestment? Or some other cloth? P.S. I want to see a phot of it in “use” or at least in its designated place when you are all done! Great idea. This piece is truly magnificent! oops–technicl problems here. What will the medallian adorn when it is finished? 9″ seems too small to be used as an alter cloth and be visible by the congregation & I don’t know if the gold could stand heavy use as a vestment (maybe it could). I really want to see the final product once the embroidery is finished. Hi, Margo – the medallion will be used on the back of a chasuble, in the center of the cross on the back. I think most vestments that are made right should be able to stand up to heavily embroidered elements. This particular chasuble is Roman in style, made from silk, lined, and so forth. It has 1″ galloons on it marking out the cross on the back, plus 1/2″ galloons surrounding the edges. So it’s not a “lightweight” vestment in the first place, and it will handle the medallion just fine. This congregation is going to be wishing for the old style mass where the priest faced the alter the whole time! I can’t wait to see the finished chasuble. Will you sew that as well? It is truly beautiful. If you have a chance, could you show how the real Japanese gold thread was added to the 5 circles? I can see that it is couched, but how does it met up at the sharp little points? Is each thread brought to the point and then plunged to the back when it has gone around a section of the circle? I’ve learned so much following this project from the beginning, I just hate to miss out on the last bit of instruction! Hi, Carrie – I’ll show the gold couching work up close, probably next week. Because the angles where the “petals” of the cinquefoil meet are so sharp, I’m actually plunging at each intersection, rather than just pinching the thread and continuing on. I debated about this point and tried it both ways, but finally decided if I wanted to maintain that sharp angle and have it really visible as a “corner” from afar, the thread needed to be plunged. So the plunging takes up a bit of time, but I think it looks better with the sharp angle. I’ll show you that soon! It doesn’t really look pink in the photo above. It looks magnificent. What will you do with the Medallion when it is completed? Mary, did I miss the registration for Mary Cobleigh’s online class? Now that I can see a bit more of that pink in context, I can say for sure that I love it. Because it’s not cotton candy colored, and because it’s not center stage, you’ve definitely avoided that Barbie aisle/Pepto Bismol effect that non-pink people fear. Good call! This is absolutely stunning. I am coming around to the pink as well, which looks great. Can you tell us how the gold was placed around the five petal ‘flower’ that holds the actual initials? In this photograph it looks like flat gold and I seem to have missed the post where it was applied. I knew you would! Usually after you’ve gone thru the spectrum, the final color choice is the one you keep! Still, it is absolutely gorgeous! It has been fun to follow your blog and watch the progress of this ambitious project. I agree that the rosy shade of pink looks wonderful. Good call. I like it! That little dash of pink seems to pull your eye from rose to rose. I like that sense of movement in the design. I’ve read your description of what it’s for, though I don’t understand the words (I’m guessing it’s not for a Presbyterian Church!!) Would love to see the final placement on the vestments, or whatever. I’m in awe of your ability to take things out and redo them. I’d have given up ages ago, or gone on, and then regretted the finished project forever. A true mark of craftsmanship–the patience to make it perfect. This is so beautiful. I have thoroughly enjoyed every progress report (and yes, the pink is wonderful and a very wise choice). Those roses really pop out and make the whole piece look so beautiful! The person who is getting this is extremely lucky. Good luck on the dots, I’m sure it will be somewhat tedious to work them all. It looks sooo beautiful ! I haven’t commented before because like you I have been busy with the pomegranate goldwork project, but I have been following the blogs. come to a stage where I become exasparated and feel like giving up with a project I always think of you and it helps me to stick with the project. Previous Previous post: Stitch Play: Casalguidi Stitch – or Really Raised Stem Stitch! 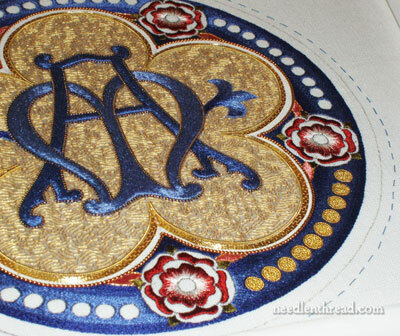 Next Next post: Monogrammed Whitework – An Exquisite Piece of Needlework!